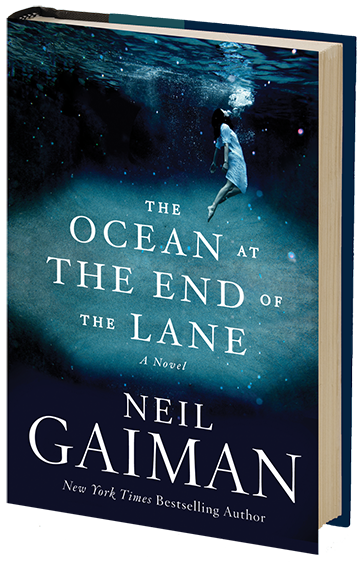 I’m a fan of Neil Gaiman’s work, and I had planned to pick up The Ocean at the End of the Lane at some point, but it wasn’t at the top of my to-read list. As I’ve mentioned, I’m on a bit of a space opera kick right now, and I wanted to keep my head submerged in that bucket awhile longer. But then I started seeing the reviews Gaiman shared on Twitter, and the blog post his wife, Amanda Palmer, put up about the book, and … well, I bought into the hype. And then I bought the book, and now I’ve read it. I’m just going to say right up front, I don’t get it. I don’t get what the hype was about. when he finally got the galleys of the paperback, i could finally read the book in a few sittings, with my own eyes. read it, not hear it. it all started to make sense. i cried a lot. and even THEN, i didn’t get it. it wasn’t until we were at TED, taking a walk up a little hill in long beach a day or two before my talk, that i finally understood. we were chatting about the book, i asked him a question about some of the symbolism in the story….and he stopped in the middle of the sidewalk and looked at me. and he filled in the blanks, and connected the dots for me. I feel like Palmer did, like I missed it completely. Unfortunately, I don’t have Gaiman around to connect the dots for me, and I really wish I did, because I want to know what I missed. Joe Hill read the book and raves about it; he apparently did not miss it. Ditto a few other reviewers. Here’s what I think I missed, and maybe some of you who didn’t miss it can tell me if I’m right or, if I’m wrong, connect the dots for me. Gaiman says in the afterword that he borrowed a lot from his childhood, but fictionalized most of it. So I’m thinking that the core of the book is what’s true and what I’m missing: something terrible—something possibly life altering—happened to Neil Gaiman as a boy, and this book is the emotional truth of it. The story was about how he’d almost run off to Canada after he found out he’d been drafted to fight in Vietnam. When he finished the “reading” of it, he paused for a moment and then said, “And here’s the thing: I made that all up.” In truth, he said, after he found out he’d been drafted, he played a lot of golf and worried a lot. But the way he wrote it, with all of the things that he said he did but hadn’t done, that was how he captured the emotional truth of the story. That was how he made the reader feel what he’d felt that summer, waiting to go off to fight a war he didn’t believe in, had protested against, and now would probably never come home from. In order to tell the truth, he had to make up a story. So that’s what I feel I’m missing from The Ocean at the End of the Lane . I feel like I’m getting the emotional truth of what happened to Gaiman, but not the actual events. Because everyone—Neil Gaiman and Amanda Palmer and Joe Hill—they all say that this is Gaiman’s most personal book yet. For me, however, hearing them say that feels like I’ve been left out of the secret. I liked the book, don’t get me wrong. It’s by turns horrifying and funny and scary and heartbreaking. It’s a great story. I’m just unable to connect the dots, which leaves me feeling frustrated and stupid. I think I would have enjoyed the book much more if I hadn’t read all the praise for it. Perhaps someday Gaiman will give a talk or write a blog that connects the dots for people like me in the way that he connected them for his wife. Until then, I’ll enjoy The Ocean at the End of the Lane as a very enjoyable story. I’m halfway through and enjoying it. It is well written, but not mind-blowingly so. Also, I can’t get over how brief it is. Not a lot of pages there. Still, a good book. I feel like, though, you will get all that gushing every time Gaiman writes a book, no matter what. You are currently reading Writing about Reading: The Ocean at the End of the Lane at Kicking the Pants.